One of the largest low cost starter systems you can get. If your budget is very limited and you still want to get started etching as quickly as you can and at as low a cost as possible, this just might be for you. It is a nearly full size, stand-up cabinet with most of the features of the larger cabinets. Good size for gifts and awards and accepts glass panels as large as 24" X 32". Easy to use with illustrated instructions. Pour abrasive into cabinet hopper through side loading door. Place hands in gloves, and just pull the trigger.Comes assembled except for installation of bolts to attach the hopper and legs. 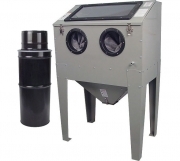 The hopper is 18" deep with a spring loaded trap door for easy cleanout. Low cost shipping by UPS. Comes in two cartons and weighs 90 lbs. We do consider this a starter cabinet or a hobbyist cabinet because it is made of lighter weight materials than our other cabinets. Also the included siphon blaster is not nearly as fast at blasting as a dedicated pressure blaster. If you start out with this cabinet, one of the first things you will want to do as your usage increases will be to get a pressure blaster to use with the cabinet. On the other hand, if your only use will be to surface etch designs on beveled glass gift items and such, this cabinet and siphon blaster will do fine. 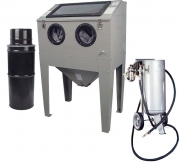 Comes complete with attached gloves, full size viewing window, full size side door, small interior spotlight, and includes a siphon blaster with 3 extra nozzles and an air jet. 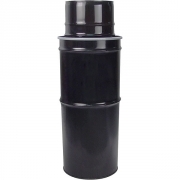 Used with this siphon blaster, abrasive automatically recycles through the cabinet via the pickup tube in the hopper. All you have to supply is a vacuum & compressor, though we recommend an optional magnetic base light for illumination across the full interior of this cabinet. 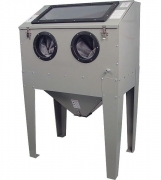 HEPA 100 DC designed specifically for removing dust created while blasting. 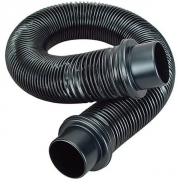 Powerful 115 volt motor and 6 ft. X 2.50" I diameter vacuum hose. Stands 48" high X 13 " in diameter. Pressure blaster: can be added for a more efficient blasting method. This cabinet will allow you to get started inexpensively and provides a large interior workspace. It requires a bit more assembly than the more expensive cabinets, but did we mention it is inexpensive? *Please note: You can substitute 120 grit (300111) silicon carbide for faster cutting, but you get a coarser finish. Substitute 180 grit (300110) for even finer finish on architectural glass and tiny detail on awards (but slightly slower cutting). 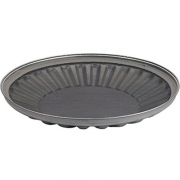 A grit size of 220 (300156) would be used exclusively for the fine detail on awards and gifts or for etching photos. The 180 and 220 grits are slightly more expensive. Check our abrasives page for more info. How to Order : To order the full system in the Suggested Systems box above without any changes, just click on "Add one to basket" by that product choice below. Then, you can add a second 50 pound box of abrasive, extra nozzles or a second magnetic light individually (as most people do, since you save on shipping over ordering these later). If you want to change some of the suggested components of the system, do not add the system itself to your basket, but scroll down the product list and add each product individually. To see your total, click on the "Basket Contents" button at the top of the page. If you want to delete anything you have added, just click "Remove" in the Basket Contents page. Then you can click your browser's Back button to go back to the systems page and substitute another product. Important: We will call you to verify your purchase of any full system before placing the order. Systems do not include compressors. We do not sell compressors, but offer compressor selection information on our compressor page.